Imagine 10 year old Rudi Scherff: mixing chemicals, creating reactions, and dreaming of the time when he becomes a mad scientist. Though he isn’t a mad scientist, Mr. Scherff is busy pursuing the career in the sciences he wanted as a chemistry teacher and paraprofessional at Amherst Regional High School. During his childhood and pre-teen years, Mr. Scherff would often mix chemicals and take stuff apart just out of curiosity. “My whole life I was trying to figure out why stuff happened or how it worked,” said Mr. Scherff. This interest in the sciences and desire to understand how the world works continued all throughout his teenage years. Mr. Scherff’s mentor is science teacher Mike Thompson, who has worked at the high school for 18 years as a chemistry teacher and for a period of time as an interim assistant principal. 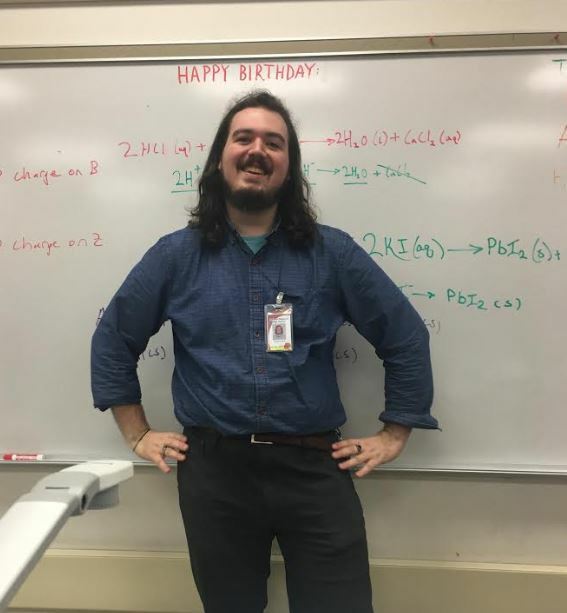 Mr. Thompson cited his ability to work with students, along with his knowledge of science, as reasons for why he’s so enthusiastic about him as a new teacher. According to Mr. Scherff, this year has been going really well so far.